Despite bin Laden’s contribution to the Chechen effort, he does not have control of operations there. [Terrorism Monitor, 1/26/2006] Zacarias Moussaoui will later be linked to Khattab (see August 22, 2001). In 1996, Zacarias Moussaoui begins recruiting other young Muslims to fight for Islamic militant causes in Chechnya and Kosovo. [Time, 9/24/2001] He recruits for Chechen warlord Ibn Khattab, the Chechen leader most closely linked to al-Qaeda (see August 24, 2001). Details on his Kosovo links are still unknown. For most of this time, he is living in London and is often seen at the Finsbury Park mosque run by Abu Hamza al-Masri. For a time, Moussaoui has two French Caucasian roommates, Jerome and David Courtailler. The family of these brothers later believes that Moussaoui recruits them to become radical militants. The brothers will later be arrested for suspected roles in plotting attacks on the US embassy in Paris and NATO’s headquarters in Brussels. [Scotsman, 10/1/2001] David Courtailler will later confess that at the Finsbury Park mosque he was given cash, a fake passport, and the number of a contact in Pakistan who would take him to an al-Qaeda camp. [London Times, 1/5/2002] French intelligence later learns that one friend he recruits, Masooud Al-Benin, dies in Chechnya in 2000 (see Late 1999-Late 2000). 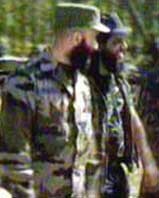 Shortly before 9/11, Moussaoui will try to recruit his US roommate at the time, Hussein al-Attas, to fight in Chechnya. Al-Attas will also see Moussaoui frequently looking at websites about the Chechnya conflict. [Daily Oklahoman, 3/22/2006] Moussaoui also goes to Chechnya himself in 1996-1997 (see 1996-Early 1997). 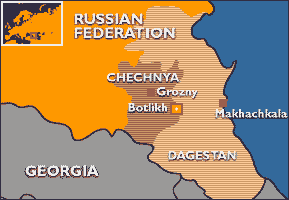 According to British intelligence, Zacarias Moussaoui fights in Chechnya with Islamist militants there. Using previously gained computer skills, he mostly works as an information specialist. He helps militants forge computer links and post combat pictures on radical Muslim websites. It is not known when British intelligence learns this. [USA Today, 6/14/2002] Moussaoui also helps recruit militants to go fight in Chechnya (see 1996-2001). He likely assists Chechen warlord Ibn Khattab, the Chechen leader most closely linked to al-Qaeda (see August 24, 2001). Mohamed Harkat. [Source: CBC]In February 1997, Mohamed Harkat, an Islamic militant living in Canada who is being monitored by Canadian intelligence (CSIS), contacts a person in Pakistan whom he refers to as Haji Wazir. Harkat asks him about Ibn Khattab, a warlord in Chechnya linked to al-Qaeda, and other people linked to Islamic militancy. Canadian intelligence is monitoring the call. In October 1997, Harkat is interviewed by Canadian intelligence and he tells them he has a banker friend named Haji Wazir and that he has deposited some money in Wazir’s bank. Canadian intelligence will later comment in court documents that Haji Wazir is another name for Pacha Wazir (haji is an honoric for someone who has been on the haj, or pilgrimage, to Mecca), and that Wazir is a “shadowy financial kingpin from the United Arab Emirates.… Wazir was the main money-handler for Osama Bin Laden.” Furthermore, Harkat is involved with terrorist financing for Khattab and al-Qaeda in association with Wazir. [Canadian Security Intelligence Service, 2/22/2008 ] Presumably Wazir becomes known to Western intelligence agencies at this time, if he is not known already, but no country will take any action against him until one year after 9/11 (see Late September 2002). The Defense Intelligence Agency acquires a report on the connections between Osama bin Laden and Chechen rebel leader Ibn Khattab. The report states that Ibn Khattab fought with bin Laden in Afghanistan and established training camps in Chechnya at bin Laden’s request. It also says that bin Laden has met with Chechen leaders and agreed to help them with “financial supplies”, and that the Chechen camps will be used to train European militants to conduct kidnappings and terrorist acts against French, Israeli, US, and British citizens. A direct route from Afghanistan to Chechnya has been established through Turkey and Azerbaijan, and is being used for “volunteers”, as well as drug smuggling. [Defense Intelligence Agency, 10/16/1998 ] What US intelligence knows about the relationship between Ibn Khattab and bin Laden will play an important role in the handling of the Zacarias Moussaoui case just before 9/11 (see August 22, 2001 and August 24, 2001). Bin Laden has personally approves an al-Qaeda plan to hijack a US airplane. A French intelligence report in January 2001 will describe an al-Qaeda plot to hijack aircraft, possibly one flying from Frankfurt to the US (see January 5, 2001). The report notes that, “In October 2000 bin Laden attended a meeting in Afghanistan at which the decision to mount this action was upheld.” [Le Monde (Paris), 4/17/2007] At the meeting, bin Laden also decides that his next action against the US will involve a hijacking. However, there is still disagreement among al-Qaeda leaders over how the plot would work. [Agence France-Presse, 4/16/2007] The French report also claims that in early 2000, bin Laden met with Chechen rebels, the Taliban, and other al-Qaeda leaders to begin planning this hijacking (see Early 2000). 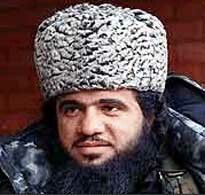 The Chechens are likely connected to Chechen leader Ibn Khattab, who has a long history of collaboration with bin Laden (see 1986-March 19, 2002) and is said to be planning an attack against the US with him around this time (see Before April 13, 2001). The French will apparently pass all this information to the CIA in early 2001 (see January 5, 2001).